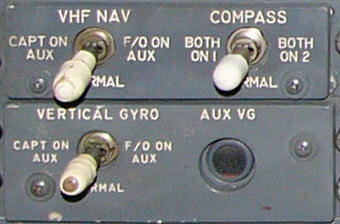 Radio Position: This is computed automatically by the FMC. 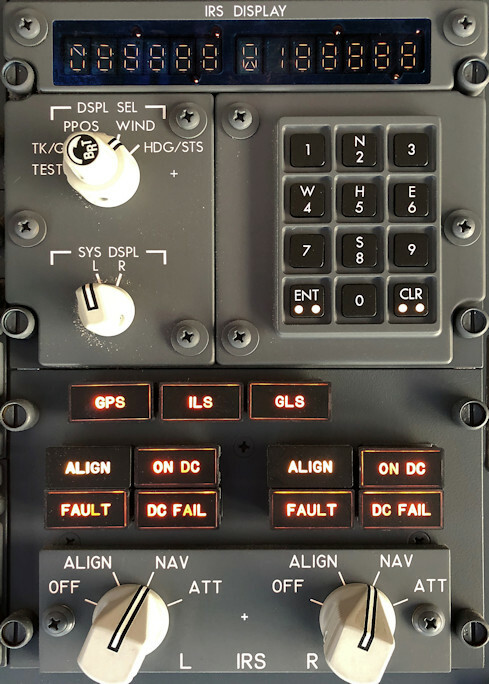 Best results are achieved with both Nav boxes selected to AUTO (happens automatically on NG), thus allowing the FMC to select the optimum DME or VOR stations required for the position fix. 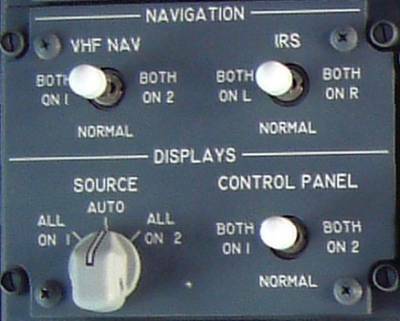 Series 500 aircraft have an extra dedicated DME interogator (hidden) for this purpose and NG's have two. 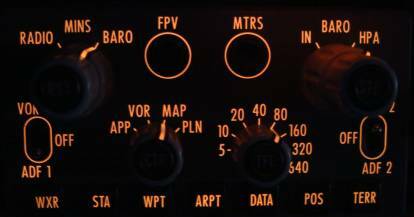 Radio position is found from either a pair of DME stations that have the best range and geometry or from DME/VOR or even DME/LOC. The NAV STATUS page shows the current status of the navaids being tuned. Navaids being used for navigation (ie radio position) are highlighted (here WTM & OTR). 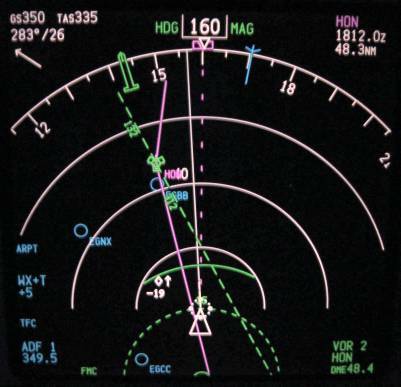 FMC Position: FMC navigational computations & LNAV are based upon this. 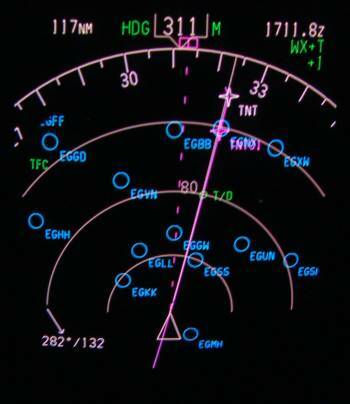 The FMC uses GPS position (NG's only) as first priority for FMC position updates, it will even position update on the ground. If GPS is not available, FMC position is biased approximately 80:20 toward radio position and IRS L. When radio updating is not available, an IRS NAV ONLY message appears. The FMC will then use a “most probable” position based on the IRS position error as found during previous monitoring when a radio position was available. 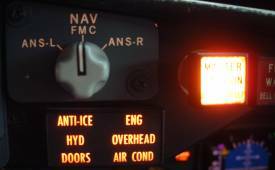 The FMC position should be closely monitored if IRS NAV ONLY is in use for long periods. The POS SHIFT page shows the bearing & distance of other systems positions away from the FMC position. Use this page to force the FMC position to any of those offered. The The ND DME readout below the VOR may not necessarily be that of the VOR which is displayed. 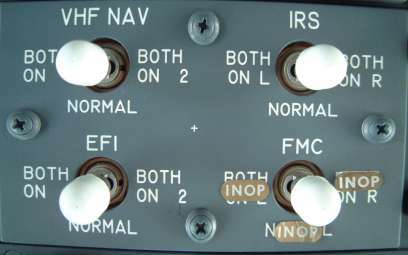 This photograph shows that Nav 1 has been manually tuned to 110.20 as shown in 1L of the FMC. DVL VOR identifier has been decoded by the auto-ident facility so "DVL" is displayed in large characters both on the FMC and the bottom left of the ND. Below this is displayed "DME 128" implying that this is the DME from DVL VOR. 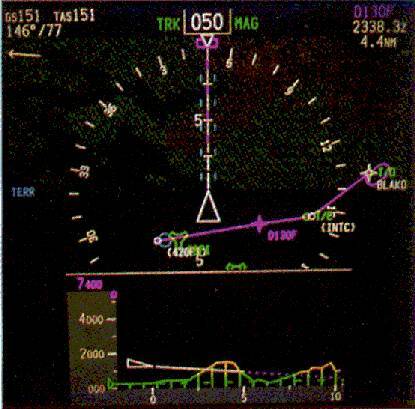 However it can be seen on the ND that the DVL VOR is only about 70nm ahead. In fact DVL is only a VOR station and it has no DME facility, the DME was from another station on 110.20. The second station could be identified aurally by the higher pitched tone as "LRH" but was not displaying as such in line 2L of the FMC. I only discovered this by chance as I happened to be following the aircraft progress by tuning beacons en-route (the way we used to do!). In my opinion, this illustrates the need to aurally identify any beacons, particularly DME, you may have to use, even if they are displayed as decoded.